Whether you’re heading to the worksite or setting off on a weekend getaway, the new 2019 Toyota Tacoma truck offers all the power you need to take on New York roadways. Thanks to the remarkable 2019 Tacoma towing capacity, hauling heavy loads over long distances will be a breeze. And when you upgrade to a 2019 Toyota Tacoma SR5 or a new Toyota Tacoma TRD Sport, you’ll take advantage of even more impressive performance features. Want to learn more about the 2019 Toyota Tacoma 4×4 system and new Tacoma mpg ratings? Visit our Toyota dealership near Henrietta, NY, to view the new Toyota Tacoma specs! Explore the 2019 Toyota Tacoma trim levels when you come by our New York Toyota dealership. 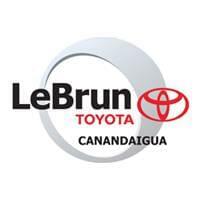 The LeBrun Toyota finance team will be happy to answer all your questions about the new Toyota Tacoma price and our 2019 Toyota Tacoma lease specials!